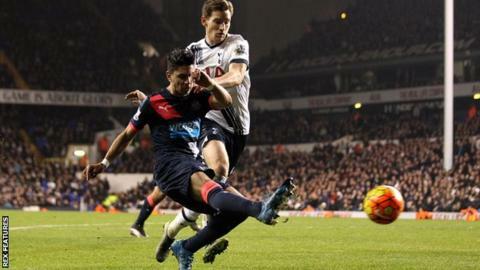 Newcastle striker Ayoze Perez says he is happy at the club despite being linked with moves to Premier League rivals Tottenham and Manchester United. The 22-year-old has started 10 games this term, but was dropped to the bench for the wins over Liverpool and Spurs. Spaniard Perez has scored 11 goals in 55 appearances since signing from Spanish second-tier side Tenerife in January 2014 for a reported £1.5m fee. "Newcastle have made me a better person and a better footballer," he said. "I'm really happy here and that's what I have to think - try to do my best every week, grow as a player and that's it. "I have two more years here, so a long time, and that's good for me because every day I want to grow as a player and try to be in the team and score goals."